Has an employee not been abiding by the rules and policies in your company? Is he constantly tardy or has incurred a lot of absences? Is his productivity low? Is he sleeping on the job or refusing to work on an assignment? 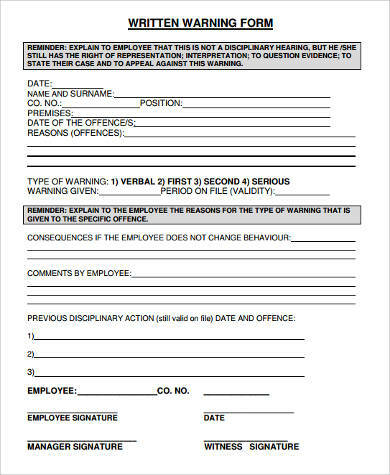 Written Warning Notice Forms are used if you have already given a verbal warning to this certain employee and you still did not see any noticeable change in his behavior, or if the gravity and nature of the offense calls for something more than just a verbal warning. 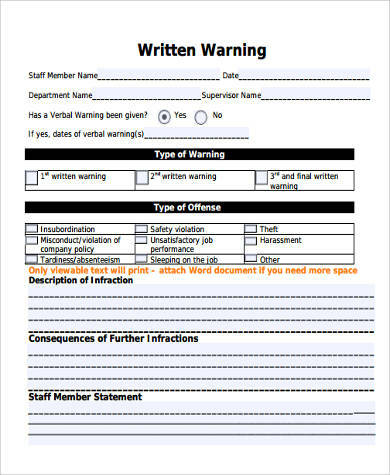 Written Warning Forms are used to document an infraction and to implement discipline in the workplace. When your employees are disciplined, they are happier and more productive. You may use Employee Warning Notice Forms for this. 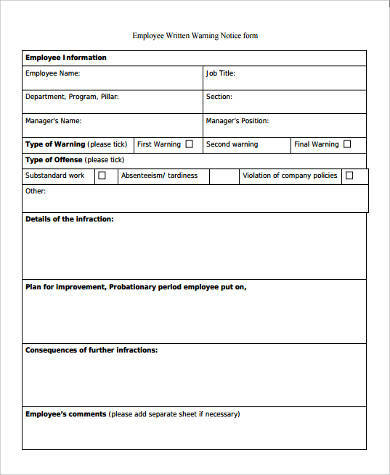 With Written Warning Forms, an employer is able to provide a conducive working environment for other employees who are abiding by the rules of the company. 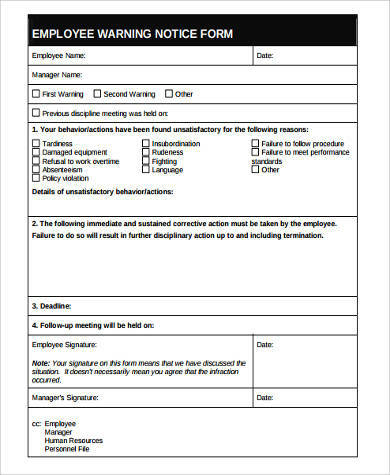 In any company, certain levels of disciplinary action must be followed in the event of an infraction or violation of company rules and policies. First is the verbal warning, followed by a written warning, a final written warning, suspension, and if there would really be no improvement, termination should be deemed reasonable and necessary for the preservation of the business goals of the company. 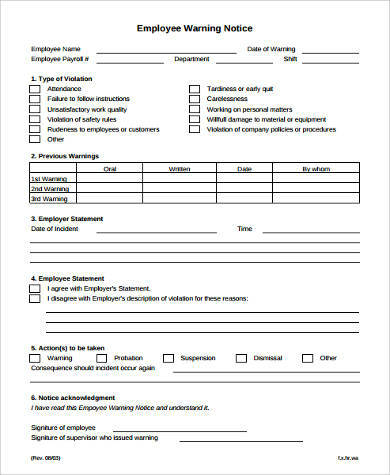 Following this process and documenting any disciplinary action as they happen can help a company prevent any liability issues in the future if an employee ever complains about termination. This is because the employee has agreed to correct his behavior lest the disciplinary action be escalated, and has signed on it. State the name of the employee and his corresponding manager. State the violation incurred with details. Also indicate what kind of written warning you are issuing, whether it is an initial or a final written warning. State any previous disciplinary actions taken, along with the date. State the disciplinary measure that is going to take place from that point on, and what commitments the employee will take to prevent the violation from happening again. Also include the possible consequences should there be any violations again in the future. 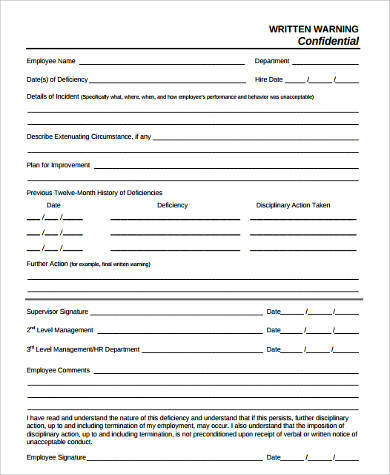 Affix the signature of both the employee and the manager, and a Human Resource personnel if necessary. Discipline is important no matter where you are. Without it, we would be living in a world of anarchy and chaos where people just do whatever they wish to do without any consequences. And any business that wishes to keep their company running for a long period of time should have policies in place to preserve their company and to help their employees be the best versions of themselves. 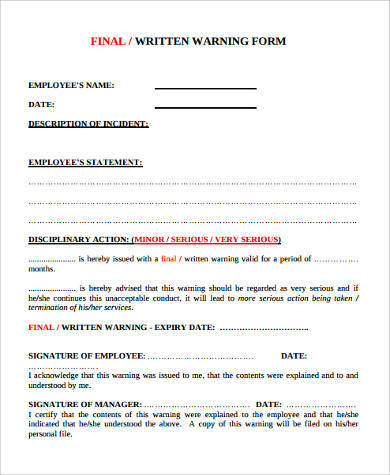 A Written Warning Form is more than just a disciplinary action; it is also an opportunity for an employee to be heard. 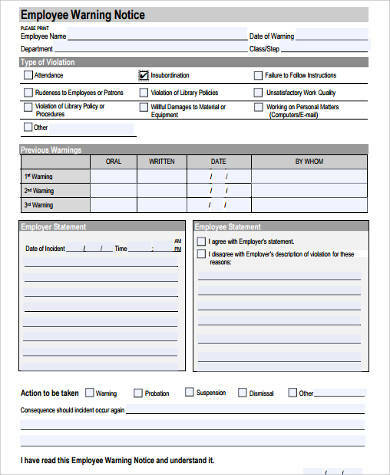 You may also check out our Employee Discipline Forms for more discipline forms.